Time Capsule, Apple's brand name for an Airport Extreme Base Station with an integrated hard drive and power adapter, is now shipping. Here's a look at what's in the box, and how the new Apple TV-sized wireless backup unit stacks up against the existing AirPort Extreme. 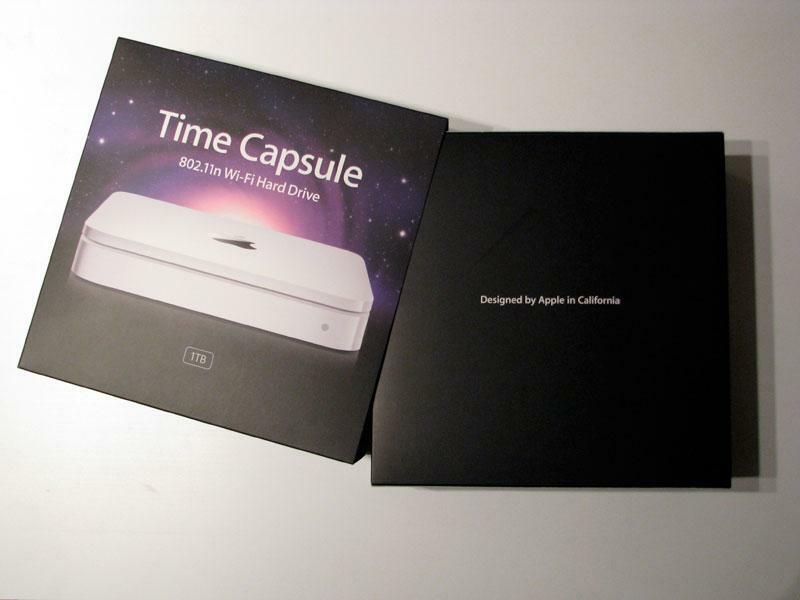 While AirPort wireless devices have long been shipping in white boxes, Time Capsule ships in a black box with a purple galaxy graphic (below) reminiscent of Leopard's space themed desktop background. The association is a clear nod toward the new wireless base station's support for Leopard's Time Machine feature. 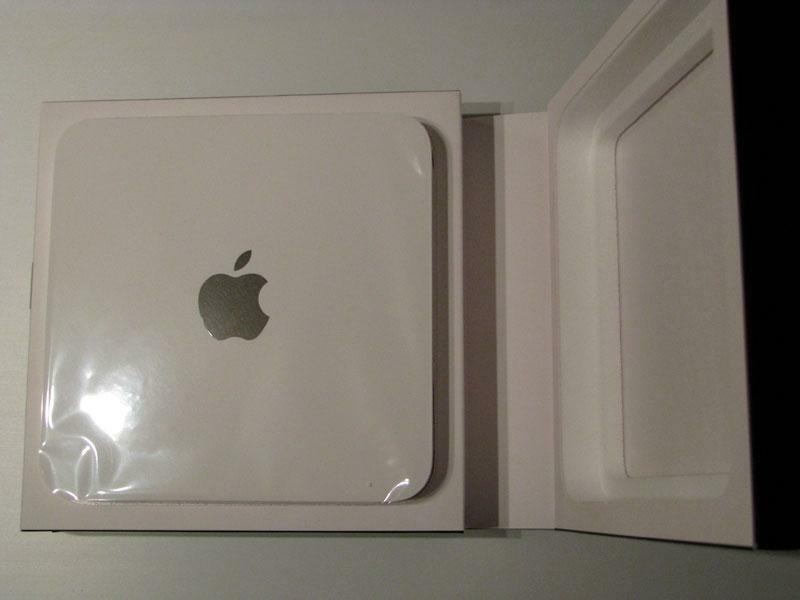 The packaging borrows from the iPod's, with a paper cover that slides off to reveal a plain black box (below) with the words "Designed by Apple in California." The paper and styrofoam box opens like a book to reveal the shrink wrapped base station unit (below). Underneath the device is a white envelope with regulatory information, a setup guide booklet, install software, and an AC power cable (below). 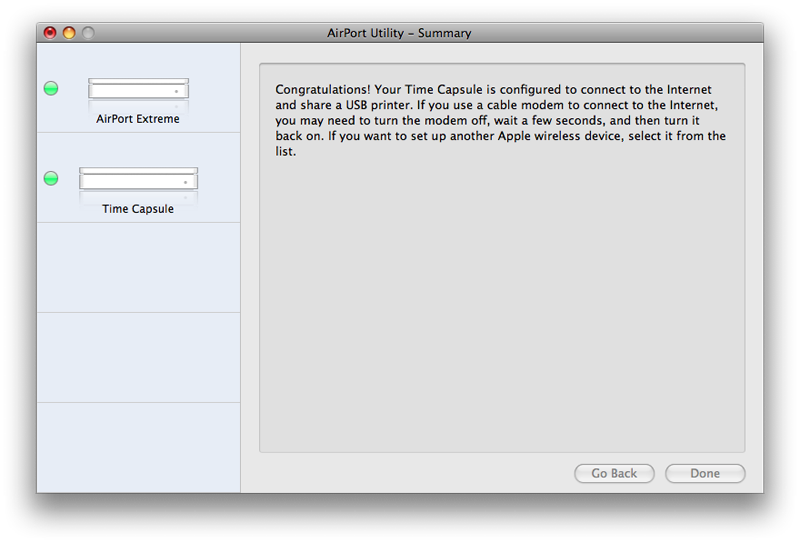 There's no power brick because Time Capsule includes the AC transformer in the unit itself, just like the Apple TV. 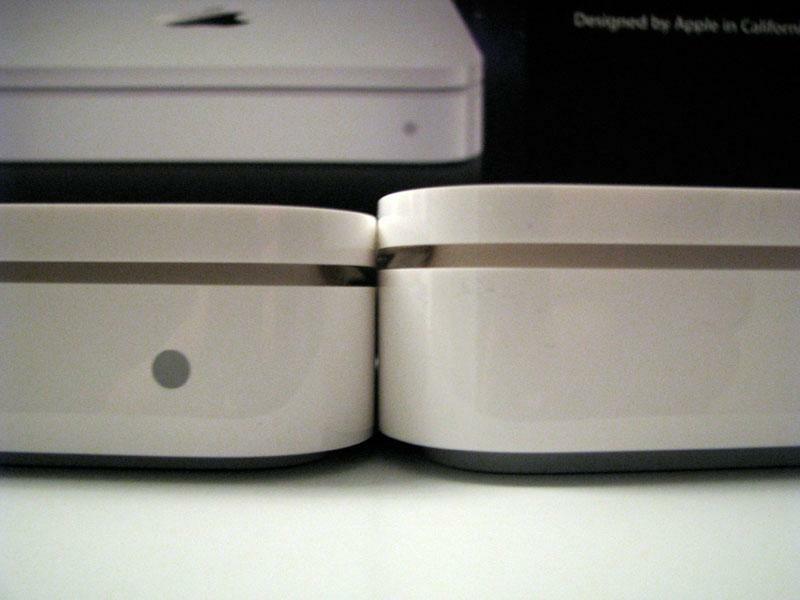 The existing AirPort Extreme uses an external power adapter (below), which helps makes it slightly smaller at the expense of having a longer tail and another box to hide. Time Capsule also manages to find room inside itself for a full sized 3.5" hard disk drive with either a full or half terabyte capacity. 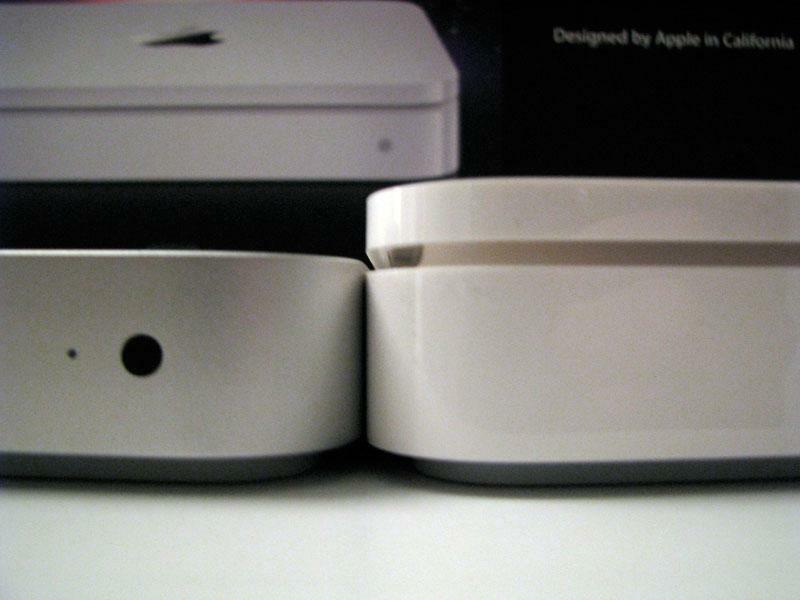 Time Capsule has the same 7.7" square outline as Apple TV, making it noticeably larger than the existing 6.5" AirPort Extreme when stacked (below), as well as being a bit heavier. It has all the same ports as the existing Extreme, although Time Capsule has a regular AC power plug instead of a round DC adapter for the AirPort Extreme's power brick. 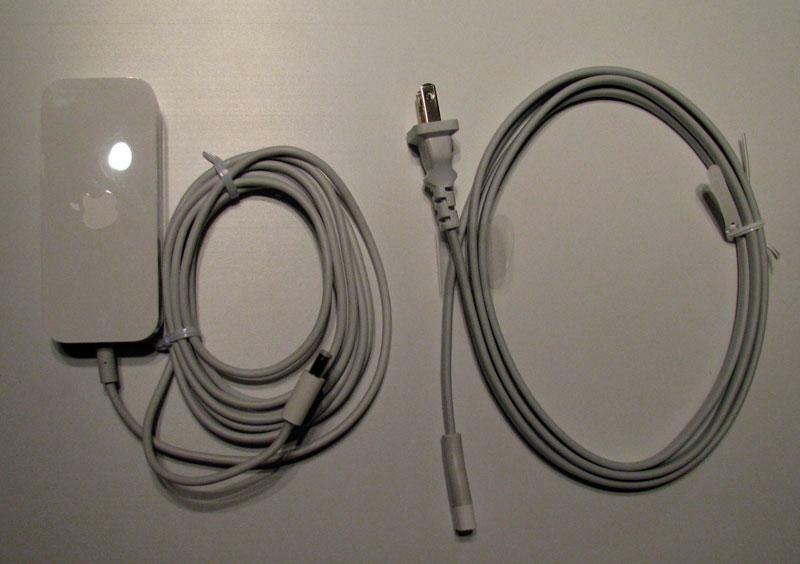 USB is used for connecting additional hard drives or shared printers; there are three Gigabit Ethernet LAN network jacks (just like the second revision of the Extreme; the original unit only supplied 10/100 Fast Ethernet ports) a WAN network jack, a reset button, and a security hole for a locking cable. All three units share the same rubberized bottom, which is glued to the base in a way that makes opening up the unit awkward but not entirely difficult. There aren't any intended user serviceable parts inside. Users who outgrow the supplied 500GB or 1TB drive are expected to add an external disk via USB rather than peeling the drive open to swap in a larger model. 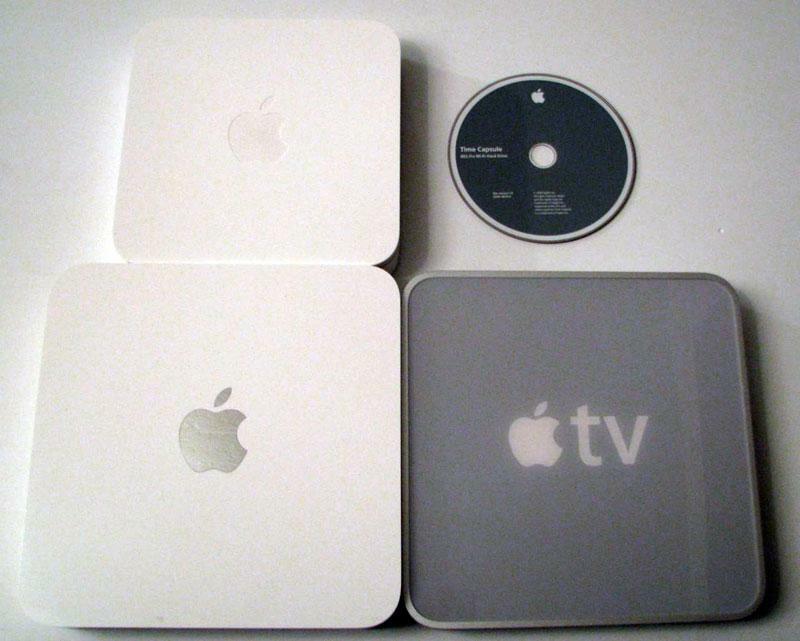 The only other cosmetic difference is that Time Capsule has a shiny, mirror finished Apple logo on top rather than the Extreme's plain embossed logo outline or Apple TV's printed logo on a glossy inlaid plastic panel (below). 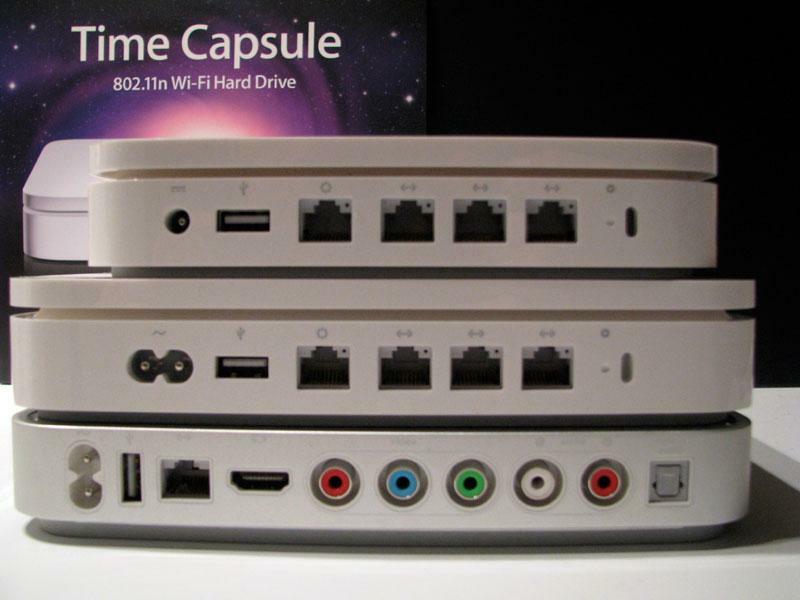 Time Capsule is just slightly taller than the Extreme and shares the same slotted top design (below top), while it's a full lip taller than Apple TV (below bottom). 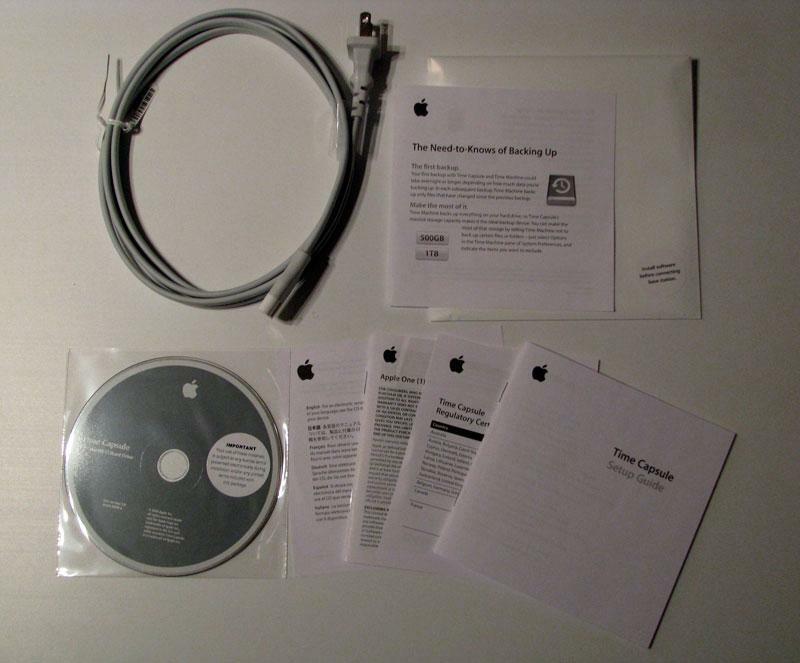 The installer CD includes a PDF version of the printed user guide, a brief read me, a "need to know" PDF guide about backups (also included in print as a short leaflet), and an HTML page linking to various resources on finding more information, including the extended references such as Designing AirPort Networks, at Apple - Support - Manuals. Like the earlier AirPort Extreme, the Time Capsule software includes "AirPort Extreme" 802.11N enabler software for any Macs that shipped with 802.11N hardware but did not include software drivers for it, as well as the AirPort Utility software. Setting up the unit is as easy as plugging it in, starting AirPort Utility, selecting the unit, and running through the setup assistant (below). 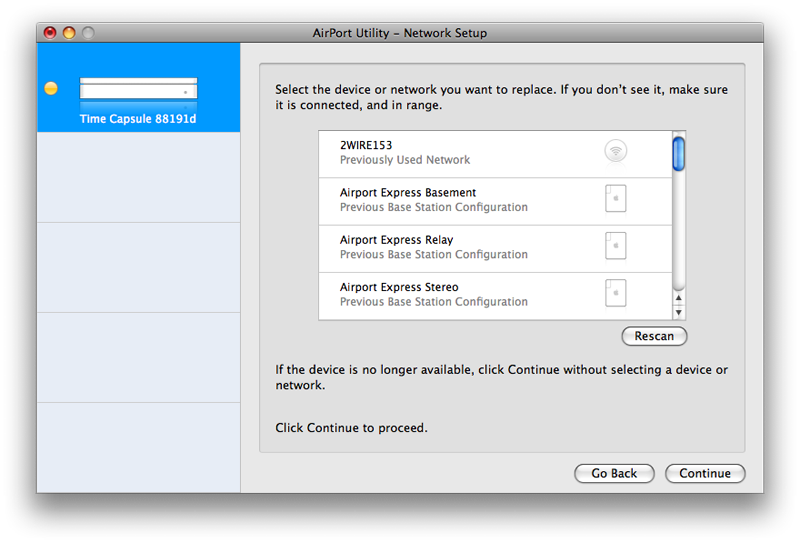 If you select the option to replace an existing base station (below top), the next option presented is to pick from one of the existing configuration settings saved by AirPort Utility, making for a painless upgrade (below bottom). Also available in the base station upgrade candidate list are third party devices saved by the local AirPort client software as previously used WiFi networks. Another option is to join and extend the range of an existing wireless network. Pick a wireless network, and the software supplies your login if it has previously been joined and the password saved to the Keychain (below). These slickly automated upgrade and expand options highlight the advantages of using standalone client software to configure the AirPort units rather than a simple embedded web page as most wireless base stations do. 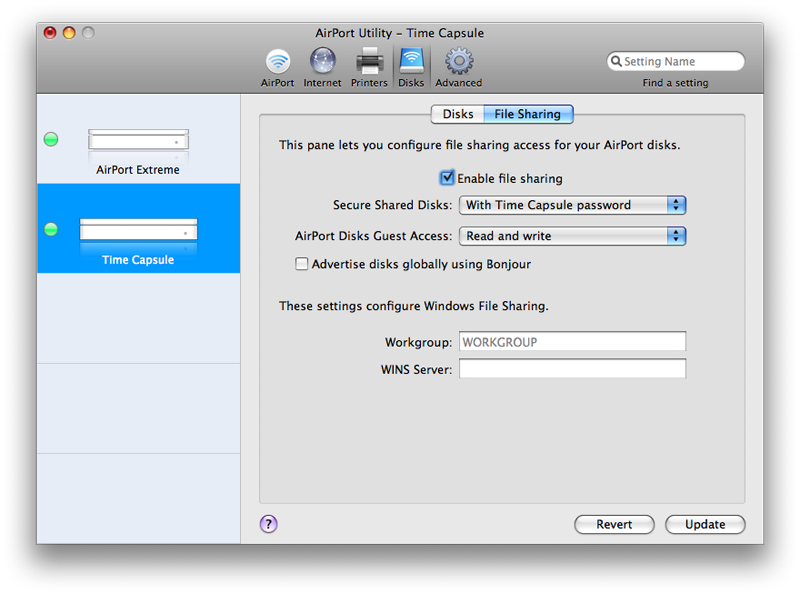 Alternatively, none of the AirPort base stations, including Time Capsule, can be set up from a basic web browser; they require installing the AirPort Utility software, which works on both the Mac and Windows PCs. The included drive is formatted and ready for use. 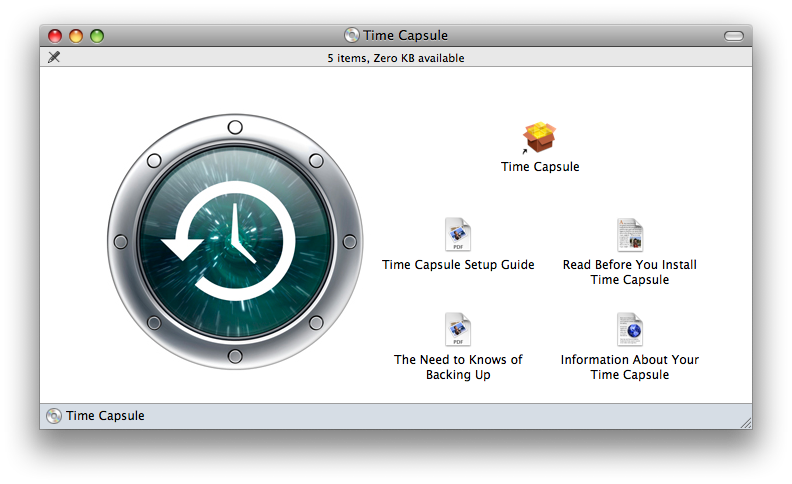 The volume name can be changed from the Disks section by selecting the Time Capsule volume (below top). To erase and reformat the drive, select the Time Capsule Disk and click Erase... (below bottom). Either page can be used to boot off all connected users. with user accounts sets up the ability to add multiple users on a third tab, each with their own password and an option to limit them to read only access or to block their access without affecting the other users. No Love for Extreme Users? 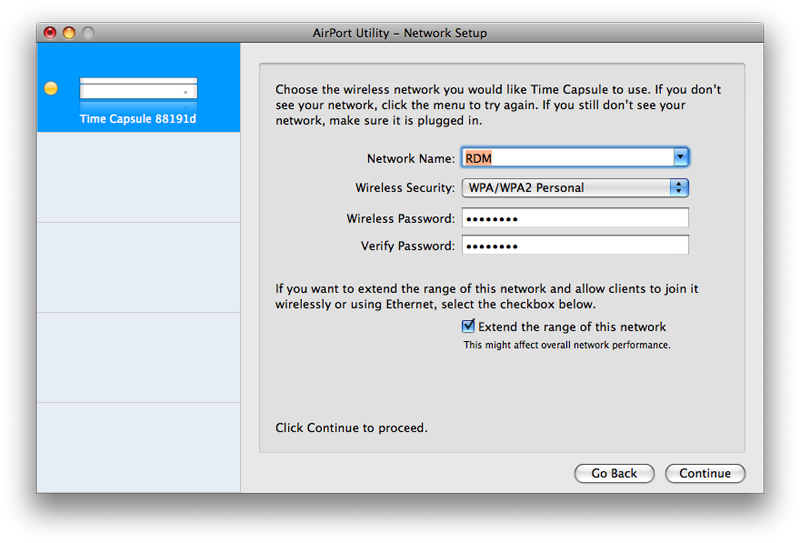 Other options for sharing USB printers, logging, SNMP, IPv6, and Bonjour services are identical to the existing AirPort Extreme. 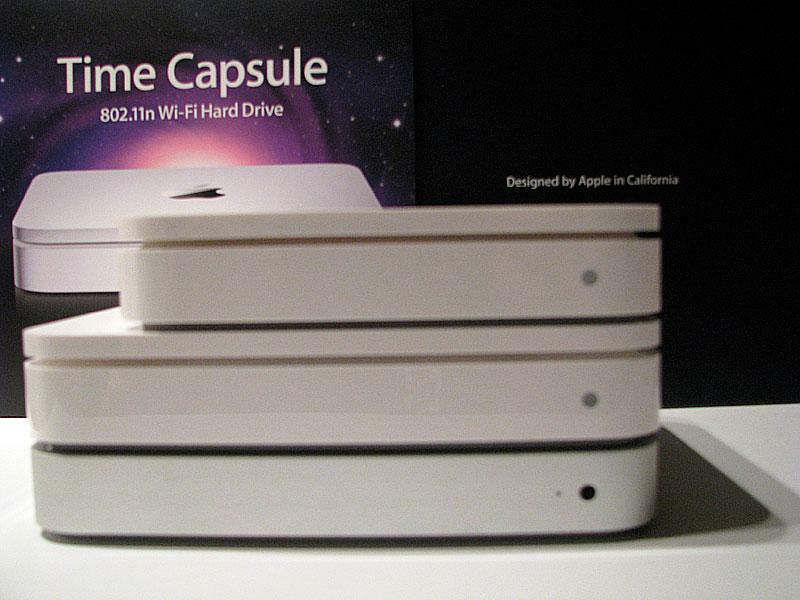 Apple continues to sell the Extreme alongside the new Time Capsule models, but hasn't yet issued an update allowing Time Machine to backup to USB disks attached to the Extreme. This is disappointing because a lot of users expect Time Machine backups to work with their existing Extreme shared disks, and Apple hasn't released any clear indication on whether this will be released or not. It would really seem petty if Apple expected its Extreme customers to all upgrade to Time Capsule, particularly since the company prominently advertised Time Machine as a feature that was planned to work with shared disks on the Extreme in pre-release Leopard information. While those features were listed as "subject to change," there appears to be no technical reason for not supporting the Extreme with Time Machine. Time Capsule also supports externally connected USB disks for use with Time Machine. We will be testing the drive included with Time Capsule against USB drives attached to an AirPort Extreme in a more in depth look at Time Capsule, but the limitations of wireless networking will likely show no difference in performance throughput between the two. Readers who would like to make special request of the reviewer ahead of the formal review can email Prince with those requests. AirPort Express $99 802.11b/g No disk sharing; USB printer and AirTunes audio sharing only. AirPort Extreme $179 802.11a/b/g/n USB disk and printer sharing; disk for network storage only. 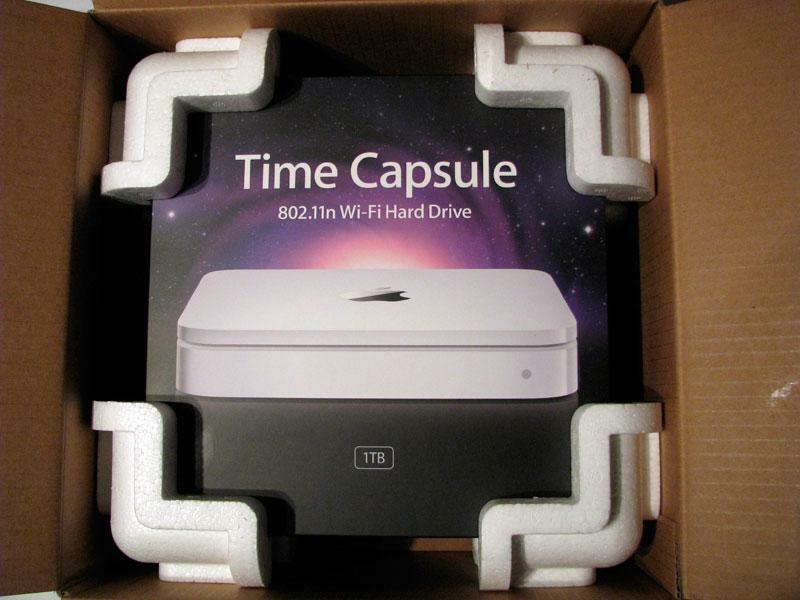 Time Capsule $299 802.11a/b/g/n 500 GB disk, USB disk, and printer sharing; Time Machine backups. Time Capsule $499 802.11a/b/g/n 1TB (1024 GB) disk, USB disk, and printer sharing; Time Machine backups.